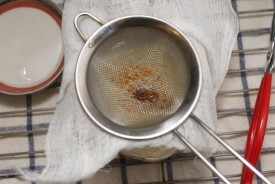 In yesterday’s post about whole grains and kichari, I mentioned toasting spices in ghee. Gee, you might have exclaimed, what’s ghee?! Ghee is a type of clarified butter commonly used as a cooking fat in traditional Indian and Ayurvedic cooking. You may have already gleaned that I love learning about ancient food traditions. In my other life, I’m an acupuncturist, and dietary recommendations as well as herbal formulas figure prominently into my practice. While I don’t by any means claim to be an expert in Ayurveda, I have had exposure to it for more than 15 years since I started practicing yoga. Over that time, I have noticed many similarities between the two ancient traditions, but also some major differences. Both speak of a life-sustaining energy and focus on balance and prevention. Both have strong dietary and herbal theories that stress seasonality and individuality. They even use many of the same spices and plant materials. But the use of ghee (and dairy in general) is not something that Ayurveda and TCM have in common. Butter is mentioned only occasionally in TCM texts, and it’s treated just as any other “herb” in Chinese medicine: used in small amounts to treat or manage a specific condition. In Ayurveda, and in traditional Indian cooking in general, ghee is used as a common kitchen pantry staple, prevalent in daily cooking. Lucky them – It’s delicious! 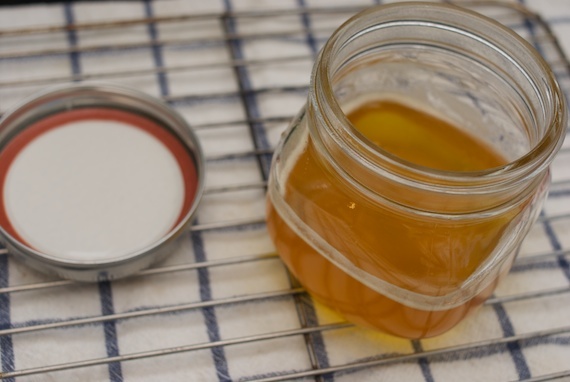 Ghee is simple to make, and now that I’ve done it once and seen how easy and incredible it is, I’ll be stocking ghee in my pantry too. Literally my pantry – once the water is all evaporated from the butter, and the milk solids are strained away, the resultant ghee is shelf-stable. (That said, I would hate for anyone to get sick, so my official stance is to store homemade ghee in the fridge.) To get the 101 on how to make ghee, I turned to my Indian cooking guru, Julie Sahni, and used the “recipe” from Classic Indian Cooking. Its really not a recipe in the traditional sense, but rather a number of steps that follow in a sequence. 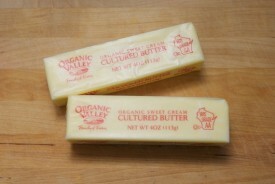 There’s only one ingredient, butter, so use the best quality you can. I am hoping to pick up some pastured butter this weekend in Vermont, but for this batch I used what was in my freezer, Organic Valley. If you’re going though this process, it would be silly to use less than 2 sticks. Ms. Sanhi’s recipe calls for a pound (4 sticks), but I only had 2 sticks and it was fine. The process is pretty straight-forward. 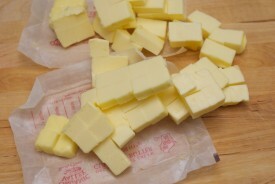 Cube up the room temperature butter. Heat slowly over very low heat in a heavy-bottomed pot. Once completely melted, raise heat to medium. The butter will beginning to crackle and pop as the water evaporates. 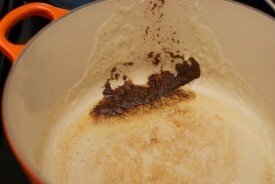 Continue to cook until the sounds subside, and the foam on the surface mostly goes away. It is not necessary to stir during this phase. Now, stirring constantly, cook the butter until the solids at the bottom of the pan turn brown, and the butter darkens to a caramel color. There will be a thin foamy layer on the surface, push this aside with a spoon to check the status of the solids. Turn off heat, and allow the solids to settle on the bottom. 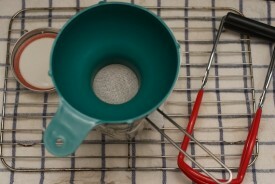 Strain into a clean, sterilized glass jar. 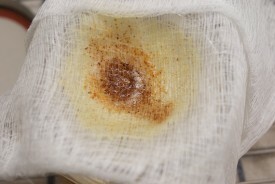 I strained through cheese cloth and a fine mesh strainer. Skim off any foam on the top of the butter in the jar. It will solidify slightly at room temperature, but remains a silky smooth texture that is perfect for stirring into sauces, vegetables, porridge or even schmearing on a thick slice of whole wheat bread. I was crazy enough to take pictures of the ghee-making process every 60 seconds. It took about 10 minutes to melt the butter fully (Ms. Sanhi says to be sure it doesn’t sizzle during this phase), and then another 10 or so minutes of cracking before I turned off the heat and strained. In terms of the crackling phase, this is what it sounded like in the midst of the best crackling part. Hover over the image and make sure you click the speaker where the “X” is – and make sure your computer’s speakers are on. Again, I am by no means an Ayurvedic authority. I’m taking a renewed interest after a wonderful workshop I attended recently given by Ayurvedic practitioner and yoga teacher Alison Cramer at Laughing Lotus Yoga Studio, and I’m very excited to learn more. That said, when I was thinking about the way Ayurveda and Chinese medicine approach dairy I realized that there lies a fundamental difference between them which is the majority of Indians (or a great many at least) are vegetarians, while the majority of Chinese are not. In traditional Chinese cooking and dietary therapy, meat and animal products are used, albeit sparingly, like a seasoning. When a person presents with an imbalance or condition in which treatment with an animal product is called for, the Chinese turn to the meat, or bones, but rarely dairy, cheese or butter. Whereas in mostly-Hindu India, meat is not an option for the masses, so they incorporate dairy products. There are many other societal and anthropological reasons I’m sure, but I think that’s a major one. If you are familiar with Chinese medicine even a little bit, or you have ever visited an acupuncturist, you may have recived a recommendation to cut down substantially on dairy consumption, or even told to avoid it completely. I’ve noticed a trend among Chinese medicine practitioners to explain to patients that many of their symptoms fall in what TCM categories as patterns of dampness/phlegm and are due to dairy consumption. This issue is addressed by an interesting article by acupuncturist, master herbalist and Chinese text analyst Eric Brand, who writes that there are few mentions in classical Chinese texts linking the consumption of butter/dairy with diseases of dampness and phlegm. I agree with his position that dairy is not the problem, but would argue that it’s actually today’s processed dairy that is cut with tons of added sugar (think ice cream, or sweetened yogurt, and would even include non-dairy products like soy ice cream and chocolate rice milk in this category) which causes the symptoms of dampness and phlegm like weight gain, fatigue, and digestive disturbances. These products obviously didn’t exist in ancient China, so they’re not included in early TCM texts. That said, I don’t think that ghee is considered problematic from a Chinese medicine perspective; it definitely should not be in the same category as frozen dairy, or even milk. 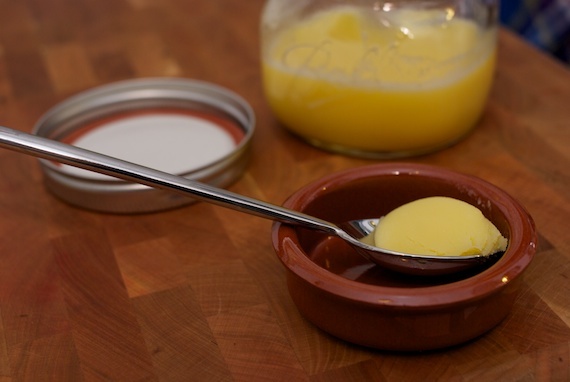 Ghee is heated and clarified and refined into a nutty, flavorful, pure animal fat. In TCM theory, animal products are considered nourishing to the deepest levels of the body: the blood, jing and yin aspects. I believe incorporating ghee into one’s diet in moderation can be beneficial for most people, and even help to treat conditions of exhaustion, fatigue and overwork. I’m very interested to continue learning more about ghee, Ayurveda and the connections between traditional chinese and traditional indian medical diets. And I’ll probably be featuring ghee in a few more recipes now and then! Falling Back in Love with Whole Grains. ← Falling Back in Love with Whole Grains.